New Delhi, Jan 12, 2019 : A few days after Air India announced that it had started carrying food from India for use during the journey back to the country, it clarified on Saturday that any misgiving about the in-flight food on Europe sectors is "unfounded" as it stayed fresh in chillers onboard, Zeenews reported. 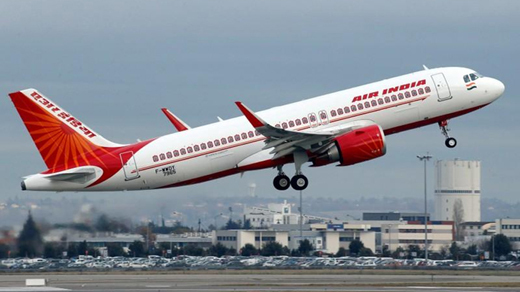 In a statement issued on Twitter, Air India said it "ensures strict compliance with quality checks at every step of its in-flight catering right from its flight kitchen". "Any misgiving about served food is unfounded as food stays fresh in chillers onboard and served piping hot to ensure authentic taste all over our network," it said to disperse passengers’ concerns regarding food quality in return flights. The airline, that has been facing a crisis, already started using food items stocked from India during its onward journey to Stockholm, Copenhagen, Birmingham and Madrid, and use them when returning. "We are following this practice on our flights up to Europe and not on our longer duration flights to the USA," the airline clarified. "Return Catering, done by leading flight kitchens adheres to laid down standards and protocols regarding the quality of food. Food uplifted at the country of origin is industry practice favoured by pax (passengers) for its taste, quality and reliability," it said. On Wednesday, Air India’s Chairman and Managing Director Pradeep Singh Kharola had announced in the capital that the airline has started carrying food from India for use during the journey back to the country, in an attempt to rationalise catering costs on international flights. "The food is taken from here in India in chillers and then it is heated whenever it has to be used...Catering costs for us are around Rs 600 crore to Rs 800 crore a year. Catering in India is 3-4 times cheaper as compared to catering in the West," he said. Within the next few months, Air India will start serving food from India on its flights returning from the Gulf region, he added. As a cost-cutting measure, Air India decided in July 2017 to not serve non-vegetarian food to economy class passengers on its domestic flights. "There are some flights, like the ones going to Gulf, Singapore and even some parts of Europe, where it is possible to upload the food here (in India) only. Some work is going on in that direction," Kharola had said.